You remember that song right? Well it’s true. Everything in your body is connected and what might show up as one ailment is really probably something else. 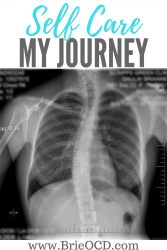 I don’t remember feeling the effects of scoliosis until I was 21 years old. My sister was getting married and I had gained a couple lbs the last few months of college and couldn’t quite fit in my dress. So I decided to go for a run. About 20 steps into my run, my left hip started hurting and that was the beginning of the end. From that day on, my hip would go in and out of severe pain to the point where I could barely walk. I was a 21 year old in a 90 year olds body. Shortly after I moved to San Diego I started going to the gym (if I had thought I gained a few lbs the last few months of college that was nothing compared to the lbs I gained taking a road trip across the country and eating McGriddles daily). While semi stretching post class, my friend said, “you have a hump on your back”. I was shocked. What 21 yr old wants a hump on their back?! My body was changing and I wasn’t liking the direction it was headed. I found out pretty early on that I had scoliosis. Scoliosis in simple terms means curvature of the spine. My mom knew since I was young but it wasn’t that bad to need a brace (and definitely not surgery). Flash forward to adulthood and it had gotten worse to the point that it was affecting everything I did physically (and subsequently mentally). As you know, everything is connected. Even though my spine was the thing that was technically crooked it made the rest of my body crooked. I am not even kidding you that I thought my tailor was hemming my pants uneven for years, until I realized it was me! My legs were off kilter because my spine was pulling one side of my body up. I started going to the chiropractor and honestly didn’t know how bad it actually was until I had a chest exam and you could see my spine (image above). For years this went on (14 to be exact). The weight fluctuations, the ailments throughout my whole body (but mostly my hip). I would go to the gym and would be feeling good for a week and then be out for two weeks. I could never really see a lot of progress because I was always tweaking something. My friends wanted me to do a powerlifting competition and I refused simply because I didn’t know if I would be healthy enough to compete. Enter August 2016 and my hip “went out” so badly that I was out of the gym for 2 whole months. I was going insane. I was going out of my mind. It was crushing my soul. I knew I needed to stretch more and take care of my body but I just didn’t want to. I had been ignoring everyone for years (especially my husband) telling me to stretch. Stretching is boring. Yoga? Who has time for that?? However I was so frustrated and depressed after this last setback that I knew something had to change. Luckily a few things changed and it all came down to SELF CARE. I switched up Chiropractors and started going to Dr Shah at The Joint in Point Loma. When my friend told me about this place, that didn’t take insurance, performed manual adjustments (I was used to the activator gun) and was a 5 minute adjustment. I was like no way. I am not a wham bam thank you ma’am kind of gal. I need attention! Well at this point I had nothing to lose and so I went anyway. I also started going for weekly 30 minute massages to work out any lingering tightness from my workouts and life in general. That same month my aunt also came to visit and suggested Yoga with Adriene on Youtube. I was like no way. I hate yoga. But I tried it anyways because it was free and I could do it in the comfort of my own home. I loved her. I loved her personality and the fact that I was home alone. If she was doing something I didn’t feel like doing, I could do another movement. These 3 changes were all SIGNIFICANT. For the first time in my life I went weeks, months, A WHOLE YEAR without any ailments!! YAHOOOOO!!! I finally agreed to compete in my first powerlifting competition and did well. I was on top of the world! I was beginning to realize that this self-care thing was REAL. Stretching, Massage, Chiropractic. All of it was contributing to a healthy and happy body! YES!! It has now been a year and a half of feeling great! I still have scoliosis because that never goes away BUT I am now taking proper care of my body and I feel the positive effects every single day. When I slack off from one of these 3 things (like most recently stretching) I feel the aches and pains. I know that I need to get back into the self care regime and I will feel so much better. When you take care of your mind and body you will feel it in all areas of your life. Self care is so important and when you put yourself on the back burner you and everyone else will suffer. So make your health a priority and start taking care of your body today because you only get one! Your story is so inspiring Brianne! And I’m so happy for all of your success and grateful you have found your voice to share your knowledge with other people who may not know where to turn. aww schucks! thank you Kimberly! !